[Jesus said,] "Yes, I realize that you are descendants of Abraham. And yet some of you are trying to kill me because there's no room in your hearts for my message. I am telling you what I saw when I was with my Father. But you are following the advice of your father." "Our father is Abraham!" they declared. "No," Jesus replied, "for if you were really the children of Abraham, you would follow his example. Instead, you are trying to kill me because I told you the truth, which I heard from God. Abraham never did such a thing." What is your claim for significance? Is it your wealth, education, health, appearance, or achievement? What about your family heritage, your neighborhood, or your reputation? The thing that matters most is what you do with Jesus! What are you going to trust to make a difference in the most important part of life, the eternal part of life? 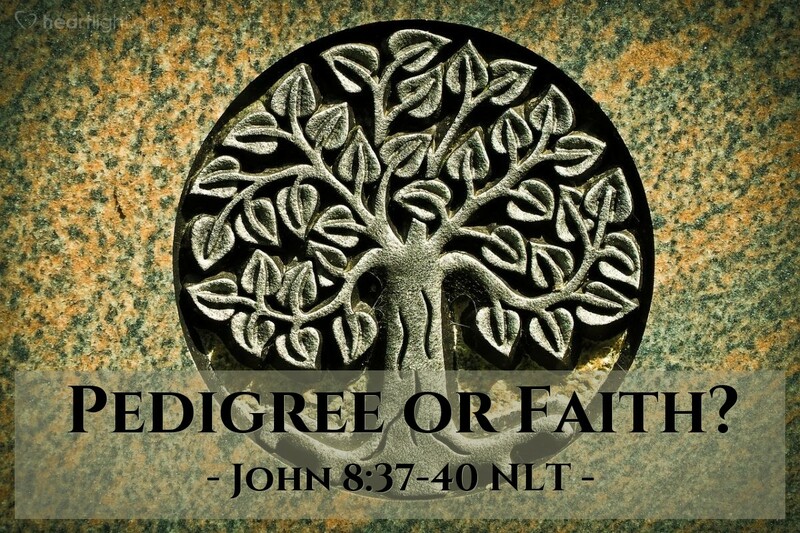 Are you going to trust in your pedigree or in your Savior? Father, forgive me because I have sometimes been arrogant about my achievements and self-righteous because of my religious heritage. I recognize that I find my life, my hope, my joy, and my salvation in Jesus, in whose name I offer you my life and my praise. Amen.